Power Joker, by Novomatic, is a classic game from Novomatic that will evoke feelings of the past and will make you double-take as after you start playing for a while, you won’t believe you’re standing in an old-school games arcade or in the corner of a pub playing this iconic and vintage slot game! It takes inspiration from land-based slot machines which makes it fantastic for players who are looking for something a bit more old-school and a little less over-complicated, like many modern video slots nowadays tend to be. Take yourself back to the good old times with Power Joker, and get yourself some insanely big wins! If you’re a fan of other vintage-inspired Novomatic slots, like Hot Chance, 4 Reel Kings and Power Stars, then you’ll definitely get a kick out of spinning these reels! It’s two games in one and, the best thing about this game is that, it has a progressive jackpot which can be won on absolutely any spin! That’s right – you don’t even have to play for ages to enable some sort of bonus feature that will give you a chance at getting the jackpot – you could win it at any time, even on your very first spin! The symbols on Power Joker are all vintage slot symbols that have been falling on the reels of slot machines since the beginning of time. Well, not since the beginning of time but since the slot machine was first invented in the 1800s at least! Slot symbols haven’t changed all that much, except on the new modern slots that are all too over-complicated for many die-hard slots fans. 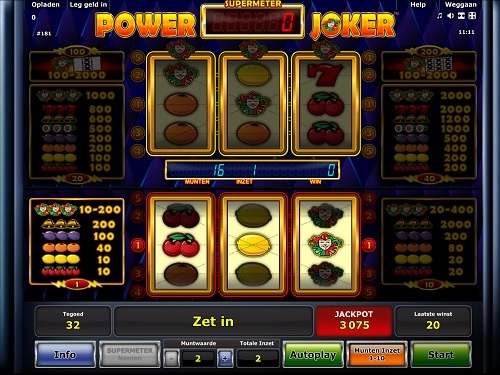 In Power Joker slot game, you’ll find fruits and bells and sevens and the joker himself! The fruit symbols include: lemons, oranges, plums, cherries, and melons! The other symbols are: the golden bell and the joker, and on the ‘top game’ there is also a red seven. The aim of both the bottom and the top games is to spin three matching symbols on one of each of the three-reel game’s five paylines. Payout amounts are displayed to the left and right of the reels and will vary according to bet amount and coin value, which you can adjust and select to your preference. Power Joker is a slot game by Novomatic that has a base game and a top game. Wins from the bottom game can either be put into your credit balance (if you so choose) or else put into the ‘supermeter’. When you have enough credits in the supermeter, you’ll be automatically switched to the top game, if you’ve chosen to play like this. Payouts in the top game are much, much higher than they are in the bottom game, so high-rollers will definitely enjoy playing this – as you also have to match a minimum bet to be able to enable the supermeter. The joker not only pays out the most in the top game, but in the bottom game he gives out mystery wins! That means, whenever you spin three of the joker symbols on one of the bottom game’s 5 paylines, you’ll get yourself a mystery win which could be hundreds the size of your bet! We are all about everything Novomatic here at NovomaticCasino.co.uk, and players who enjoy Power Joker will love exploring everything Novomatic has to offer. Here, you can play Novomatic games for free, including all Novomatic slots, Novomatic table games and Novomatic live casino games. The most popular Novomatic games are their slots, like: Book of Ra Deluxe and Mermaid’s Pearl Deluxe, as well as their authentic and top-quality, immersive live casino games, such as Live Poker and Live Roulette, which enable players to game at real tables, with real people, with real dealers but they don’t have to leave their house to go to a land-based casino!